On Sunday, March 3rd, teachers and educators in the Oakland Education Association (OEA) ended a seven-day strike by voting to ratify a tentative contract agreement. After negotiating for 18 months, they went out on strike for reasons nearly identical to the historic L.A. teachers strike in January–a living wage, smaller class sizes, and more support for students. The new contract is a significant step forward, providing educators an 11 percent pay raise over four years plus a 3% bonus, and it also includes some gains on issues like class size and support-staff ratios. Although it fell short of many members’ high hopes, especially in a limited five-month moratorium on school closures and the reduction in workload for counselors and nurses, “Oakland’s walkout has energized and transformed tens of thousands of teachers, students, and community members to fight for more. Educators have felt their own power… Though the war to save Oakland schools is far from over, after this strike, the city will never be the same,” observed journalist Eric Blanc, author of Red State Revolt: The Teachers’ Strike Wave and Working-Class Politics. OEA leaders hailed the strike as a victory, but just a first step: “This contract lays a solid foundation for the challenging fight ahead to ensure that all Oakland kids have access to fully-funded, well-resourced public schools in their neighborhood.” Union leaders know that the next phase of the fight for quality public education will need to be a statewide movement to approve the Schools and Communities First initiative in 2020 to end Proposition 13’s commercial tax loopholes and to pass a statewide charter moratorium. A recent study found that Oakland’s nearly 40 charter schools (that enroll almost 13,000 students—about 30% of the district’s enrollment) cost the district over $57 million annually. 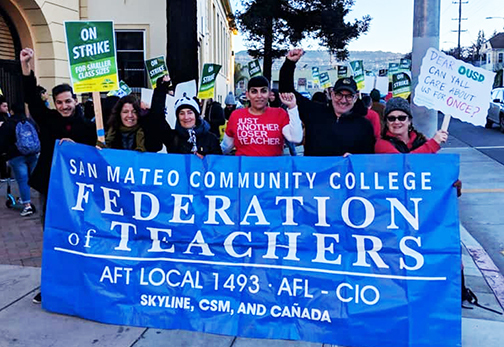 AFT 1493 members supported the Oakland strike by donating to OEA’s Membership Assistance Fund, which provided financial support to help their most vulnerable members, and to Bread for Ed, a coalition effort that provided food for students and teachers who needed the resources. (The vast majority of the 37,000 students in the district depend on free or reduced priced lunches.). The recent strike wave among K-12 faculty and staff—from West Virginia to Arizona, and Los Angeles to Denver to Oakland—is invigorating the labor movement, energizing teachers, and fueling a new national conversation that identifies chronic underfunding and privatization as the cause of the crisis in public education. Higher education faces similar threats and challenges. Most public colleges and universities—whose budgets are balanced on the backs of underpaid and under-respected contingent faculty (as of February, 64% of total faculty in our District are part-time)—are constantly pressured to narrow their mission and to shape curricula to meet “productivity” goals and market demands instead of students’ interests and needs. Despite reduced course offerings, higher education still leaves many of our students saddled with a lifetime of debt. It is critical to continue the fight for adequate funding of public education—from pre-K to higher ed.